Balance is a slim folio case that protects against drops up to 4 feet. 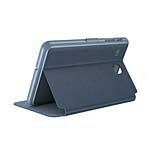 Samsung Galaxy Tab E 8.0 case with 4-foot drop protection: Balance FOLIO keeps your tablet safe from drops and bumps. Adjustable stand: Whether you’re reading, typing, or just binging on your favorite TV show, our Balance FOLIO Galaxy Tab E 8.0 case’s adjustable stand does it all. Raised edge protects screen: The raised edge around screen provides extra protection against drops. Recessed, magnetic cover: Cover fits seamlessly into case for a slim design. Magnets wake or lock your screen when you open or close the cover. Secure closure clasp: Locking clasp keeps the cover closed for added protection and helps keep the cover out of the way when using your Galaxy Tab E 8.0. Protective interior liner: Soft liner protects your tablet against scratches. Durable PU leather: Easy-to-clean materials add style and color, and stand up to daily use.